It may seem as if just about any interaction with the SCAQMD requires an application. Whether it’s permitting a new piece of equipment or making modifications to your existing facility or process, all approvals begin with the submission of a form, a fee, and an engineering evaluation or other document that provides the context needed to process your application. But just what sorts of actions require approvals? 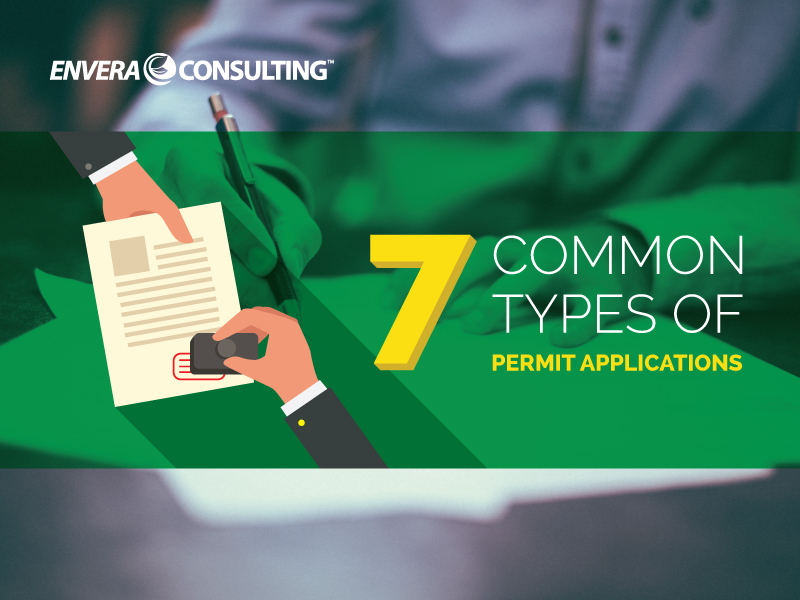 In this post, we’ll cover seven types of permit applications — and what prompts the need to submit them. Of course, there are other permit types, but these are the most common. This is perhaps the most common type of permit that we help with at Envera. This type of permit, issued after a thorough engineering review, signifies that the equipment can be constructed and/or operated in compliance with all applicable rules and regulations. This type of application might be submitted after you receive the initial permit to construct/operate. There are two common reasons — one short-term, one long — why a change of condition application might be submitted. The short-term reason usually happens soon after the permit to construct/operate is received. You might notice that there are problematic permit conditions, such as vague wording or even a condition that you know you are unable to comply with but which you hope to correct with your change of condition application. You might also submit such an application if your facility’s production levels change or if there’s a process change. Although this can occur soon after you receive your original permit to construct/operate, it more commonly happens further down the road, sometimes years later. Some SCAQMD rules — notably Rules 1110.2, 1472, and 1147 — require that you submit a compliance plan outlining how a piece of equipment will comply with specific requirements. In Rule 1110.2, for example, that requirement is called an inspection and monitoring (I&M) plan, which outlines what monitoring and testing must be done to ensure that the engine operates in compliance with the emission limits outlined in the rule. Other compliance plans include Rule 1472’s plan for emergency engines and Rule 1147’s alternative compliance plans. If the owner remains the same but the location changes, you need to reapply for a regular permit to construct. (See bullet 1.) If there is a name change but no change in ownership (ex: a company changes its name from ABC Manufacturing to XYZ Manufacturing for branding reasons), the solution is Form 200-A (Business Name Change), which also comes with a fee. Things get a bit more complicated when there’s a change of ownership. The SCAQMD has a pretty detailed chart (see page 52 of the Certified Permitting Professional Program Reference Manual) listing the various situations they have encountered and how each was resolved. Keep in mind that if you are looking at the possibility of either changing your business name or undergoing a merger or acquisition, you want to be aware of the timelines involved. A change of ownership or name change often involves mergers and acquisitions (M&A) attorneys, who should review your application to ensure it’s the correct one. These application types can fall into one of two categories, which I’m going to call “applicant-centric” or “manufacturer-centric.” The first category applies to certain rules that require equipment to be registered as opposed to permitted. Registering a piece of equipment is generally less complex than submitting a full permit, but it does require some work. Some equipment manufacturers certify their equipment directly with the SCAQMD. This “pre-approval” of sorts benefits both the manufacturer and the facility: Manufacturers have a better selling angle in that their equipment is much easier for the facility to register. Win-win. Two common examples include a Rule 1147 equipment certification as well as the equipment registration program to register or certify emergency engines, water heaters, small boilers, spray boosts, etc. Facility permits come in one of two flavors: those for facilities in the RECLAIM program and/or those for facilities in the Title V program. A facility permit, which consolidates all of the individual permits issued to a single facility into one document, tends to be issued to larger facilities, ones that have higher levels of emissions and more equipment. Depending on the situation, a facility permit is needed to enter one of the programs, to modify the permit once in the program (the most common reason), or to renew an expired permit. Let’s say you’re installing an engine at a facility that already has a facility permit. Most people will assume that they need to submit a permit application for the engine — and that’s half correct. Yes, you need to submit that application, but you must also submit one to modify the facility permit to include the new engine. Because emission reduction credits, or ERCs, hold monetary value, they can be viewed as financial instruments. Each emission reduction credit represents a specific amount of verifiable emission reduction that has taken place, whether from process changes, surrendering equipment or permits, or what have you. ERCs are used in compliance to offset emission increases associated with installing new equipment or modifying existing equipment. The amount of ERCs to be procured or surrendered is assessed during the New Source Review (NSR) process. Credits are issued to an owner, who is listed on the title. That owner can either keep the credit and use it for a future project or sell the credit on the open market. And that transfer of ERC ownership requires our seventh and final type of permit application. Obviously, there’s another type in which you bank emission reduction credits out of your facility. Banking is simply a process in which you request ERCs after shutting down or surrendering permits, when you surrender equipment, or when you have emission reductions that are real, quantifiable, and verifiable. Since ERCs are quite valuable, banking can be worth the headaches.